As a so-called Auxiliary Power Unit (APU), the fuel cell system for non-stationary applications developed under the auspices of the MÖWE project supplies transportation means such as caravans or boats with electrical energy. The APU offers a maximum net power output of 3 kWel to supply electricity to devices like air conditioning or refrigerators. To make the most of the diesel available on board, the fuel is first converted into a fuel gas rich in hydrogen. Afterward, the fuel cell will convert the gas into electricity. The fuel cell system consists of a diesel and water tank, a module to create hydrogen, a module including a low-temperature polymer membrane fuel cell (NT-PEM with 90 cells), a battery and power electronics. The development objective was to enhance process management, reduce complexity and elevate individual components as well as modules to technical maturity. To simplify the complex unit, the developers streamlined the process chain: Fuel gas that the fuel cell cannot convert is not burnt in a separate component anymore, but is oxidized directly during combustion on the reformer part. The new design no longer requires an additional fuel gas burner, including related system components. Additionally, it does away with the need for a cooling circuit and increases functional safety through the use of metal felt instead of a fuel-injection nozzle. Another essential step was the start-up acceleration achieved by enhancing the H2 production module. The employment of a burner-side mixer, which could either be used as a start-up burner or a mixing unit based on the cool flame technology shortened the ramp-up time of the fuel processor to a good half hour. And a new start-up approach further decreases the time required to fire up the entire system to under 30 minutes, as it enables a simultaneous, responsive heat-up of the catalytic reactors (see Figure 2). As soon as the reformer reaches the necessary operating temperature for oxidative steam reforming (OSR), air is let in to be mixed with fuel and steam. The resulting, albeit temporary, partial exothermic oxidation of the fuel gas releases heat directly into the reformer component. The aim was to find a quicker way to provide reforming and supply heating to the water-gas shift reaction of the H2 production module. At the same time, the process allows the fuel cell to reach operation temperatures more quickly. When the approach was implemented, the different operation modes could be seen in the mixer. It required no changes to the components of the hydrogen module. In operation mode A, the metal-felt evaporators are being preheated electrically. In mode B, the two start-up burners are ignited to preheat the reformer catalysts. Mode C will start the cool-flame operation at the burner-side mixer, in order to directly heat the reformer through catalytic combustion. As a result, the heat-up of the reformer will also be visible at the outlet. As soon as the temperatures required for OSR operation is reached at the inlet and in the middle of the reformer, the system will change to reforming mode (mode D). OSR is used to heat the water gas-shift reactors and, optionally, the selective oxidation reactor. When all system components have reached their operation temperatures, OSR will switch to steam reforming (SR). This strategy helped push the time needed until steam reforming was in effect down to between 20 and 25 minutes. March 2015 was the month in which design and installation were concluded and the demonstration system was brought into operation. 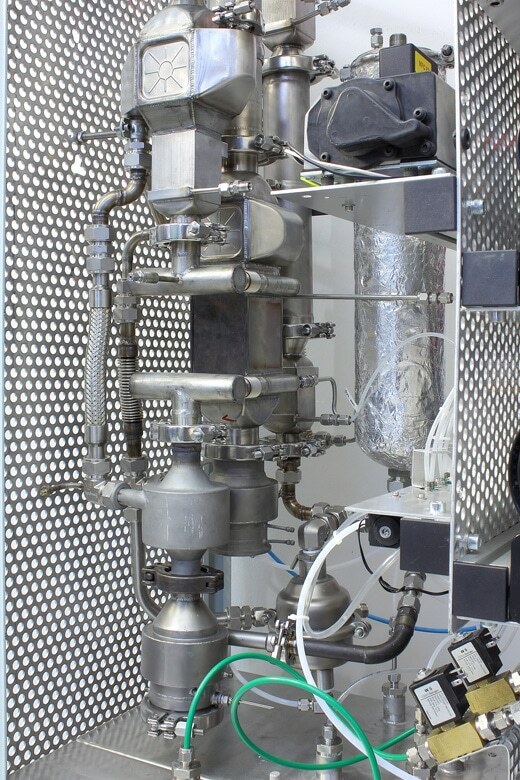 The functional capabilities of the system were showcased successfully during stand-alone operation of the fuel cell stack and the power module over a sample test cycle. During the run, the system operated without being connected to the lab infrastructure (stand-alone run). Tanks supplied all required transfer fluids. The amount of inlet air was regulated by a fan. The electrical energy created was consumed to supply internal system components, charge the battery or otherwise utilize the energy. During the demonstration, the use cases for electrical loads were construction site floodlights requiring around 300 watts each as well as a temperature control system with a power output in the range of 1 kW. The battery was used to initiate several stand-alone system start-ups. • As the system is run by diesel, it does not require additional fuel. Diesel is available everywhere and possesses a high energy density. • Steam reforming results in extremely high H2 gains at great partial pressures (up to 70% dry, no N2 dilution). • The NT-PEM fuel cell is market-ready, offers a long lifespan and short start-up times. One challenge with which the developers were faced throughout the entire joint MÖWE project was the impact of the reformer operating temperature on stability when using a low-temperature PEM and commercially available diesel. A long-term test of the reformer with heating oil low on sulfur confirmed that catalyst degradation caused by sulfur and soot when reforming can be largely avoided by implementing a new regeneration approach. Portable generators with an output of around 3 kWel have so far been only available with gas or diesel engines. Noise and emission regulations, however, restrict their use on parking lots for motor homes or in port areas. Conversely, the fuel cell system presented above is low on noise, emissions and vibrations. The developers see the diesel-fuel cell APU as a promising technological approach that could spark the interest of several market segments, such as motor homes or yachts.